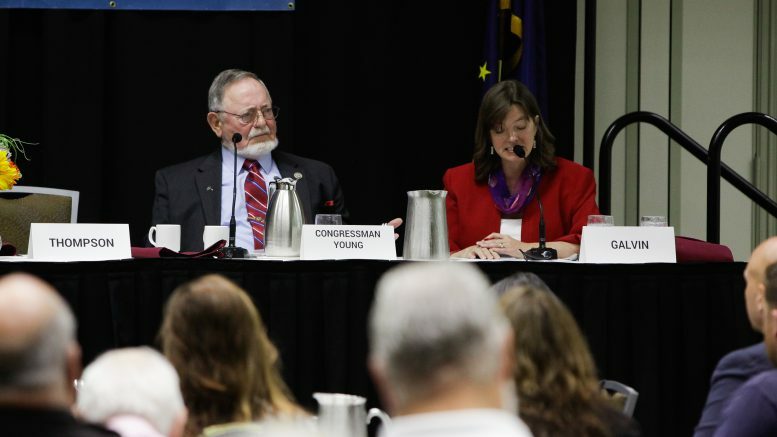 Independent congressional candidate Alyse Galvin, who’s running with the Alaska Democratic Party’s nomination, came out swinging against U.S. Rep. Don Young at the Anchorage Chamber of Commerce’s Monday forum. But her toughest hit landed on a question about the federal budget deficit, when she attacked Young for voting for last year’s tax cut package that ballooned the national deficit. As for the tax package itself, Galvin said Young and his GOP colleagues can’t be expected to do anything else. Young defended the tax cuts, saying the way to solve the deficit is with growth and resource development, before going on to say he was deeply offended by Galvin’s attacks. He went on to cry foul over the attack. It was a well of offended sensibilities that Young repeatedly returned to throughout the debate, frequently focusing on Galvin’s attacks as an example of why she wouldn’t be fit to hold office. Galvin didn’t ease up, either, later referencing Young’s “diminished stature” when it came to the Port of Anchorage. After complaining about the lack of civility in the debate, Young didn’t keep his contempt solely aimed at Galvin, but later turned his attention to the audience during a question about the Affordable Care Act. “It was written by those that wanted to be socialists,” he said, criticizing the law. When the audience, which had a fair amount of Galvin supporters in it, laughed derisively at Young, he followed it up in his usual style. “You can laugh, you’re probably socialists, and I understand that,” he said. The forum is just one of three scheduled events that the two candidates will face off during the run up to the November election. Young’s also committed to appearing at an Oct. 16 forum hosted by the Greater Fairbanks Chamber of Commerce and a televised debate on Oct. 26 hosted by KTUU and Alaska Public Media. FiveThirtyEight currently gives Galvin a 2-in-7 chance of beating Young in November. Young and Galvin weren’t the only candidates on the stage on Monday. They were accompanied by seven–SEVEN–other candidates for the state senate. Anchorage-area Senate Districts G, K, I and M were represented at the forum. Crime was a prime topic for the state candidates. Elvi Gray-Jackson, the Democratic candidate for Senate District I (which is being vacated by Sen. Berta Gardner), seemed to win quite a bit of kudos from the generally conservative pro-business crowd when she said people need to take more responsibility in combating and preventing crime themselves (in addition to re-examining the state’s criminal justice reform and revisiting cuts to community revenue sharing). Her opponent, Republican Jim Crawford (who was the chairman of Trump’s Alaska campaign), suggested that one of the solutions to crime was bringing back elected local sheriffs. The chamber will host a forum next Monday about the judicial retention votes on the general election ballot. The judges themselves aren’t scheduled to be at the event, but Retired Alaska Superior Court Judge Karen Hunt will be there to discuss the process. 2 Comments on "Don Young calls Alyse Galvin ‘nasty’ after she questions the Republican’s campaign contributions"
Don Young is EIGHTY FIVE years old and has been in Washington for FORTY FIVE YEARS!!! It is time for a change. How high of an elevation in the Mason lodge is Don Young?We need to know just what that entails in our society!